Mix 2 tbsp of water, 1 tbsp honey, thyme sprigs and ¼ cup blueberries in a heavy saucepan. Mash the blueberries using a potato masher and place over medium-high heat. Bring it to a boil. Remove from heat, cover the pan and keep it aside for 15 minutes. Uncover the pan and discard the thyme sprigs while allowing the syrup to cool. 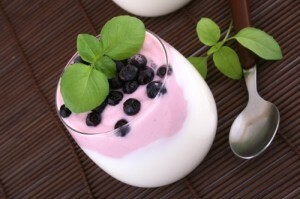 Blend the remaining blueberries, yoghurt, 1/3 cup honey, agave, lemon juice and the cooled syrup prepared. Blend until the mixture is smooth. Transfer the mixture to a glass container and allow it to freeze for at least 8 hours. You may even leave it overnight. Serve the slightly soft, frozen yoghurt in bowls. Take a large bowl and put in the Cool Whip, yoghurt and fruit in it. Pour this into a pie shell that has been pre-prepared. Smooth the edges and cover it. Freeze the mixture for 3 hours. Prior to serving shift the mixture to a refrigerator for half to one hour. Slice and serve with fresh strawberry garnishing. You can use blueberry, raspberry or other fruits. Copyright © 2019 Yoghurt. All Right Reserved.